I responded, ‘Igbo, that’s one of the articles of wear of the Igbo people’. The man dropped one of his bags, extended his hands, and as we shook hands he effusively exclaimed, ‘I’m your brother. I was reading about you on the flight’. Before I could say more, Dennis Klainberg, for that is his name, told me that he felt drawn to me because he spent the almost three hours flight from New York to Miami, reading about a people, and a man that occasionally wore a red fez. I realized that he was talking about the Jewish Forward story of January 24th, which was entitled ‘Meet the Igbo, Nigeria’s Lost Jewish Tribe’, which was written by Sam Kestenbaum. I mentioned that, and he concurred. We chatted for a few minutes, exchanged contact information, and I gained another brother in Miami. This Jewish shipping executive, who has his head office in New York, where he also lives with his wife and children was at my house the next day. And we took off, and explored and enjoyed Miami, first by visiting his uncle, who is a retired academic, that was quite excited to meet a Jew from a location that he did not know that Jews also existed in. From there we went to several kosher restaurants to eat and talk about the Igbo, the American Jewish condition and other matters. I particularly liked one close to the Jewish Museum where I go to study. In this you could take a book from the small library in the restaurant, and study Torah, or Talmud, while waiting for your order. By day’s end Dennis and I were familiar like blood brothers, which we are in a way. Klainberg and I have been talking regularly since then. And since then, I have been thinking: was it just coincidence, or are so many things being arranged by the Chi ukwu Himself. As I mentioned earlier, we met as I was returning from a vacation during which I toured two American states, and Washington, and met and discussed with many American Jews and a few Israelis. During my visit, I met the leaders of Kulanu Inc’, which planned my tour. I met some Jewish academics, and rabbis. At the reception in my honor at the Kulanu headquarters in New York, Jews of many backgrounds turned up. We had present rabbis of Ashkenazi and African-American backgrounds. We had men, and women. The congregation was an Israel of the colors of the rainbow. We effectively demonstrated that Israel went to all parts of the world, and is today represented in all branches of the human family, again effectively sending a message of unity to humanity! Remy Ilona, is a PhD candidate at the University of California, Riverside, where he also functions as a teaching assistant. He is also the secretary-general of Hebrew-Igbo people, an Igbo socio-cultural organization. He is also an author of 10 books. 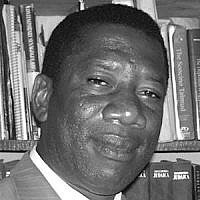 He is of Ibo or Igbo extraction, and a lawyer by training, as well as a historian of the Ibo. He is among the leaders shepherding the Ibos re-emerging Judaism.